Am I focusing on quality or quantity? Choosing to work with people based solely on the size of their audience can be a costly mistake. 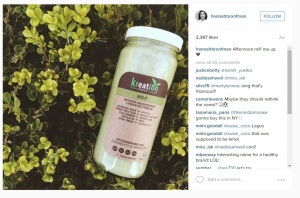 Influencers with huge audiences tend to charge brands a considerable sum to promote their products. If you haven’t checked that their followers match your target audience, this can be a total waste of money. Am I digging deep enough? By doing your research, we don’t just mean taking a quick look at their profile. It’s easy to assume that the majority of people following a healthy, in-shape female model who posts about fashion and fitness are women who share those interests. However, the reality may be that the majority of her followers are men admiring the photos… you won’t know for sure until you drill down into the demographic of your influencers’ audience. What can their analytics tell me? Online influencers are becoming increasingly aware of the value that their audience can hold for brands, and analyse their audience in increasingly sophisticated ways. Most will be able to provide you with a breakdown of their followers by demographic, so make sure you ask the question. They should also be able to share with you what type of content on their channels delivers the most engagement and at what times their posts deliver the most traction. This information can be incredibly useful when creating your campaign content plan and ensure that your collaboration is delivering maximum value. One of the biggest turn offs for social media users is the obvious plug. We’ve all seen it – a celebrity posting about a product or service when they have clearly been paid to do so. It’s disingenuous, misleading and is likely to have you reaching for the ‘unfollow’ button. It’s important that you team up with influencers who are genuinely fans of your product or service. If their posts are going to have any meaningful impact on your brand they have to be truly convinced of its merits. Even if they aren’t using the product prior to the collaboration. How will I know if they are genuine? It is usually pretty easy to tell whether the influen on or not. Focus on the types of questions that they ask you. When working for a nutrition company recently, we were keen to engage a pop star to help us tap in to her mostly female online audience. She had lots of questions about the specific ingredients in the product – what were they, how were they sourced, were they free from additives, etc. This line of questioning indicated that her priority was to ensure that any product she put her name to was something that she would be genuinely comfortable using and recommending to her followers. This made us even more keen to collaborate with her. Once the relationship has been established, it’s also well worth going the extra mile to develop deeper, mutually respectful and beneficial relationships with your influencer. If the influencers you are working with develop a genuine affection for the brand, and for their point of contact within your team, their enthusiasm will shine through in their reviews and mentions. Take American bodybuilder Michelle Bishop (@mshelllll) and her relationship with AdvoCare – an American brand, specialising in nutrition, weight-loss, energy and sports performance products. Michelle has shot to insta-fame in recent years and has built up an impressive following of 252,000. Michelle recently posted about running out of one of her favourite Advocare products and Advocare wasted no time in getting some of that product delivered to Michelle. It was a simple, easy, no-cost gesture, but it worked wonders in this instance. Michelle was clearly thrilled and quickly shared her appreciation with her followers. The genuine nature of the post is obvious and her enthusiasm for the product is infectious… which of course is exactly what Advocare were hoping for. When working with influencers it can be hard to let go of creative control. In an ideal world they would use your campaign related hashtag, specific imagery and links. Allow them some creative licence. Again, this comes back to looking and feeling genuine. If you have an army of influencers all posting the same thing, then it will be easily apparent to your audience that the related posts are being driven by the brand and not the individual influencer’s enthusiasm for your product. Posts with personality are far more engaging. Remember you’ve chosen to work with this person because their social media profile has attracted a dedicated following. So don’t quash the very thing that made you want to work with them in the first place by being too restrictive about how, what and when they post. The right collaboration will unlock a potential audience of thousands, or hundreds of thousands. But why stop there? With most brand/influencer tie-ups there is potential to reach beyond the influencers’ social media audience by creating a story for the mass media. If you can do that, then you will be unlocking a potential audience of multi millions. Example: PHA client LDN Muscle. One of LDN Muscle’s most important online influencers is Alice Liveing, better known as ‘Clean Eating Alice’. She regularly posts about her collaboration with LDN on her social feeds which delivers great value. However, by taking her story to the Mail Online, we were able to use the relationship with Alice to deliver a whole new level of exposure for LDN Muscle. 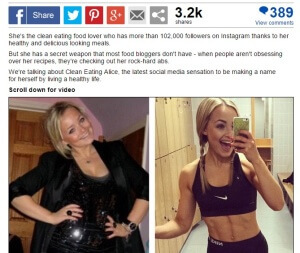 Not only were they plugged several times in the Mail’s article but, after this story ran online, Clean Eating Alice amassed an additional 25,000 social media followers in just one day. Therefore all her subsequent posts about LDN were reaching a far larger audience than they were before. This is a win-win situation all round, and is something that brands are not capitalising on enough. Working with online influencers is becoming an increasingly popular way for brands to market their products, and for good reason, but in many cases the potential value of these relationships is not being maximised to the full. By following these tips you can help make your collaboration as successful as possible and ensure that your influencer campaign is delivering the desired results.